Made in the USA quality in portable axle scales. The Cambridge Scale Works MODEL 701-PAW STANDARD FEATURES include 60,000 lb capacity (30K per platform), (4) 10K Environmentally Sealed Load Cells (Per Scale), Polycarbonate NEMA 4X Junction Box, 3” Structural Tubular Steel Construction, Diamond Tread Deck Plate, and 150% Overload Protection. The 701-PAW available from Central Carolina Scale has 3" structural tubular steel cross-strut design equally distributes weight over entire scale surface for superior strength and durability. The scale includes easy top access to the polycarbonate NEMA 4X junction box mounted inside the tubular steel frame. Watertight junction box connections make set-up quick and easy and allows multiple scales to be linked together. Features four 10,000 pound environmentally sealed load cells and rock guard to prevent debris from accumulating between scale and ramps. 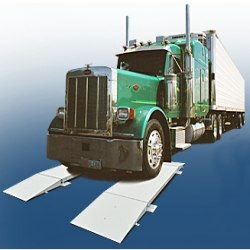 • Optional ramps are constructed with standard asphalt package so scales can be used on asphalt or concrete surfaces. 701-PAW ................ 32” X 84” X 4” ........ 30K lbs. .......... 575 lbs. ea. 701-PAW ................ 32” X 32” X 4” ........ 30K lbs. .......... 230 lbs. ea. 701-PAW RAMP ....... 32” X 36” X 4” ........ 30K lbs. ........... 215 lbs. ea.